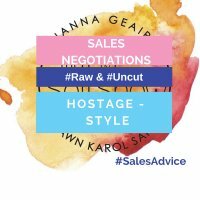 Negotiate the Sale – Hostage Style! Join Shawn Karol Sandy and me in our conversation about how to negotiate the sale. One of the fun moments is the book reveal – how to negotiate like your life depended on it. This one is all about how to get the deal closed with the best possible outcomes – for you AND your customer! (What????) Yep. For you AND your customer. It’s the raw and uncut version, so enjoy it like your favorite podcast or glass of wine.